One of my wife Catrina's favourite programmes is DIY SOS, with her hero Nick Knowles! If you've never seen it then in each programme you meet an individual or a family who have been through a tough time. Nick and his team then send them away somewhere nice while they, and a huge team of volunteers who have taken time off their regular jobs, do a total renovation of their house and gardens to make it suitable for them. It always finishes with the big reveal, where the people being helped get shown round their wonderfully transformed home, with the inevitable tears from them, the team and everyone watching. They then get to say thank you to all the volunteers who have given up their time, and the companies who have donated the materials, required to make it happen. In the most recent series they did up an entire street to house wounded veterans - for the next three weeks you can catch it on iPlayer here (just have the tissues ready!). There's something incredibly moving about the generosity of one human being helping another, for no motive other than their desire to do them good. One of the many life principles Jesus gave us to live by is that "it is more blessed to give than to receive" (Acts 20:35). 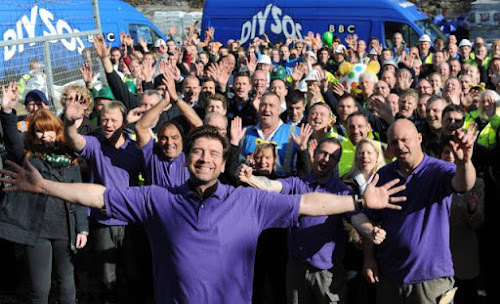 You see that in the faces of the volunteers involved in each edition of DIY SOS, that through their generosity they receive far more than they've given. It's that generosity we want to model in our forthcoming 'Generous" Gift Days, which are on Sunday 15th and 22nd November. All the money that comes in we're going to give away locally, nationally and internationally (more details about that next week). Perhaps we don't have the time, or the skills, to be involved in a DIY SOS, but we can all excel in the grace of giving. Please be thinking and praying about what you're going to give - let's model what it is to be an incredibly generous community!